TALLAHASSEE, Fla. — Volunteer Florida announced today that throughout the summer, it will highlight individuals who have been impacted by the second annual #SuitsForSession Capitol service project. #SuitsForSession, which collected over 3,200 items of new or gently-used professional attire, benefitted job-seekers statewide. Following #SuitsForSession, Volunteer Florida staff and volunteers sorted the items and coordinated delivery to Chapman Partnership in Miami, Dress for Success Tampa Bay, ECHO Outreach Ministries in Tallahassee, Bridges of America (statewide locations), and the Florida State University Unconquered Scholars program. 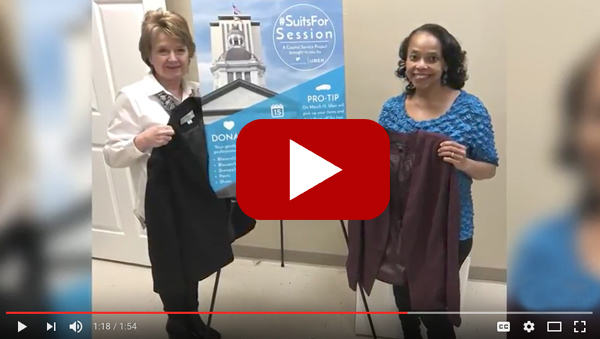 In March, elected officials, state employees, legislative staff, and members of the private sector participated in #SuitsForSession by donating new or gently-used professional attire at the Capitol. Additionally, Uber drivers picked up items for free across Leon County and delivered them to Volunteer Florida. To see a highlight video, click here. To see photos and a list of partner organizations and agencies, click here.